The Lake District is a mountainous region in the county of Cumbria in North West England famous for its lakes and fells and also for the early 19th century writings and poetry of William Wordsworth. The Lake District was designated a National Park in 1951 and is the largest of thirteen in England and Wales and the second largest in the UK. There are many fells to walk or climb many lakes to stroll round and a wide range of sporting activities for all ages to enjoy. The Lake District also known as The Lakes or Lakeland is a wonderful and breathtaking place with so much to explore. Braithwaite is a small but quaint village in the northern part of the Lake District in Cumbria only a few miles west of Keswick. The village nestles below a fell called Barrow and for such a small village it houses three pubs, guest houses, B&B’s and a campsite with a caravan park. Not far from Braithwaite is Whinlatter Forest where there are many short and long walks. Coledale Beck flows through the V shaped valley of Coledale and Braithwaite before it joins Newlands Beck north east of Braithwaite. At the head of the valley of Coledale there is a large rock formation called Force Crag where Pudding Beck passes over it to form a waterfall, High Force. 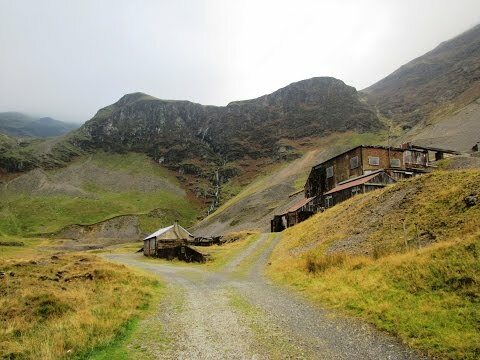 Situated below the waterfall is Force Crag Mine which was the last working metal mine in the Lakes and closed in 1991. The site was mined for lead from 1839 until 1865 and for zinc and barites from 1867 so the job of the mill was to separate these minerals from each other and from any other minerals and the country rock. The mill was rebuilt in 1908 and modified in 1940 and still contains some of the equipment that was used during the 1980’s before closure. The National Trust acquired mineral rights in 1979 but the mine ceased working in 1991 and was abandoned in 1992. The mill was restored in 2004 and the mill is open to the public on special days when guided tours are available. Admission into the mine building is by booked tours only, but there is no access to the mine itself. Appointments can be made through the National Trust. Grisedale Pike is a fell of 791 m (2593ft) high and throws down three long ridges to the valley floors. Braithwaite sits at the foot of Sleet How the long eastern ridge which is where we descend from the summit. We park in a small car park on the left just through the village on the Whinlatter Pass road (B5292). From the car park, with Braithwaite on our left, we go through the gate and follow the fairly level track, with Coledale Beck on our left, to the end of the valley of Coledale. As we near the end of the valley we can see two waterfalls, Low Force to the left and High Force on the right and below them there is Force Crag Mine where we take a good look around. We then retrace our steps back along the path for about 300 yards and take the path going off to the right that takes us over the beck. We then follow the stony track going uphill on the side of Crag Hill and with Low Force waterfall on our right until we reach the top. We keep following the path, which takes us over a little stream, and head uphill towards a dip in the skyline in front of us which is Coledale Hause. When we get to the top we bear to the right and when the path splits into four we take the path to the right, straight ahead leads to Sand Hill and Hopegill Head, going uphill. As we follow the path we see some pits on our right above High Force waterfall. We now keep following the path and then a stony track with a wall on our left to the summit of Grisedale Pike. We pass a round stone shelter on our left and then at a funny sort of an old iron gate on our left we take the path on the right. We now go steeply downhill and walk along the ridge of Sleet How. When we see a tree plantation on the hillside in front of us we turn right and follow the well worn path downhill. When we reach a sort of barrier low to the ground we take the path to the right and Braithwaite and Keswick can be seen below. We now keep following the path which bears round to the right through some trees and down some steps and we enter the car park at the opposite side to where we started. This is a hard walk on unlevel stony paths with steep inclines and declines and the ascent to Grisedale Pike is very steep. On the summit of Grisedale Pike, like all the high fells in Cumbria, the weather conditions can change very quickly. Always be prepared. Approx 6.75 miles using OS map 4, The English Lakes North Western Area. Braithwaite is in the Lake District, Cumbria. Braithwaite is 2 miles further west from Keswick on the B5292 just off the A66. Car park is on the left just through the village on the Whinlatter Pass road (B5292) there are more car parks further on in Whinlatter Forest. There are public toilets in Braithwaite and nearby Keswick. For refreshments in Braithwaite there are three pubs The Royal Oak, The Coledale Inn and The Middle Ruddings Country Inn and Restaurant. In Keswick there are ample shops and pubs in the town centre. Thank you for your very nice comment. We are trying to build a site for tourists and begginers. Everything we find on the web seems too complicated for someone who is new to walking in the lakes. It was disappointing when we tried to walk the Julia Bradbury Wainwright’s Walks to find out that they are one way only, upto the top of the fell and back on the same route. So we decided to try and film circular walks to make walking easier for everyone. My wife map reads this allows me to film and do the commentary at the same time this is all done in one day. We do this in our spare time as we both work. Its the great feed back from people like yourself that keeps us going. PS these are the walks we have already filmed and will be on the website shortly. Great Gable, Stony Cove Pike, Bowfell, Crinkle Crags, Fairfield Horseshoe and Wansfell Pike. We hope to do a few more before the end of the year, if the weather holds out.